Shrewsbury Auction Centre hosted Round 10 of the BTRDA Autotest Championship, organised by Whitchurch Motor Club. Three tests were laid out, each to be attempted five times, and damp conditions greeted the 24 competitors at the start. The leading cars were unaffected, and when conditions dried out, test times visibly reduced, and yet no penalties were incurred by the leaders. After six tests, Malcolm Livingston (Lindsay Special 1600) held a slender 1 second lead over Dave Mosey (Mini Special 1430) who was in turn a further 1 second ahead of Dave Evans (Blitz Special 2000). Willie Keaning was a further 18 seconds back, and leading the sports car class by 2 seconds from Chris Chapman (RAW Striker 1700), Steve Morten (RAW Striker 1800), and Ian Chapman (Xmoor Riot 1700). Warren Gillespie (Nova 1600) was leading the saloon car class by just 2 seconds from Toby Cook (Micra 1300), both comfortably in the top 10 overall. The lunchtime scoreboard saw Malcolm Livingston increasing his lead to 15 seconds over both Dave Evans and Dave Mosey, who were in turn 23 seconds ahead of new sports car class leader Chris Chapman, 4 seconds in front of Willie Keaning and Steve Morten. 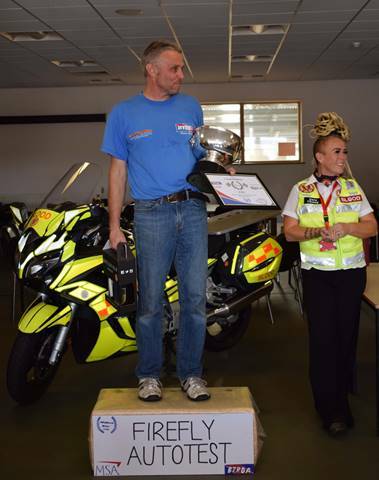 Ian Chapman was the only leading competitor to collect a 5 second penalty, and was now 7 seconds behind Steve Morten. Warren Gillespie now had a 10 second lead over Toby Cook, the Micra driver having collected a 5 second penalty. The third test of the six to be run in the afternoon saw a dramatic change in the order when Malcolm Livingston collected a maximum penalty, dropping him to 3rd in the specials class, leaving Dave Mosey with a 1 second lead over Dave Evans, Livingston a further 4 seconds down. Chris Chapman found a 5 second penalty, but retained the sports class lead over Willie Keaning and Steve Morten, whilst Warren Gillespie found some extra speed to open up a 54 second lead over Toby Cook in the saloons. The final placings saw Dave Mosey take overall honours by 2 seconds from Dave Evans, with Malcolm Livingston a further 9 seconds back, whilst Chris Chapman took 4th overall, trailing Livingston by 26 seconds but beating Willie Keaning by 6 seconds in the class.